TEMPE, AZ – Jessica Marie Green of Tempe, Arizona, passed away peacefully in her sleep alongside family on June 12, 2018 at the age of 40. Diagnosed with MDS in November 2017, Jessica unfortunately lost her long battle with acute myeloid leukemia after multiple stays at the Mayo Clinic in Phoenix, Arizona. Jessica Marie Cole was born on September 4, 1977 in Saginaw, Michigan to Douglass Lyal and Diane Marie (Dreffs) Cole. She is survived by her husband Andrew, her parents, her sister Kathleen (Joseph) Schaar, her stepmother Karen, her brother Noah, and her nieces and nephew Ashley, Cole, and Rachel. Jessica spent the first 18 years of her life in Michigan. She graduated from Saginaw’s Heritage High School in 1995, and moved across the nation shortly afterwards to attend Arizona State University. Jessica graduated from ASU in 1999 with a Bachelor of Science in Management. It was at ASU that Jessica met her future husband in 1997. Jessica and Andrew married February 2, 2002 in Orlando, Florida and built a home in Gilbert, Arizona. Jessica also obtained a Master of Science in Information Management in 2008 from ASU. In 2016, Andrew and Jessica relocated to Tempe, Arizona. 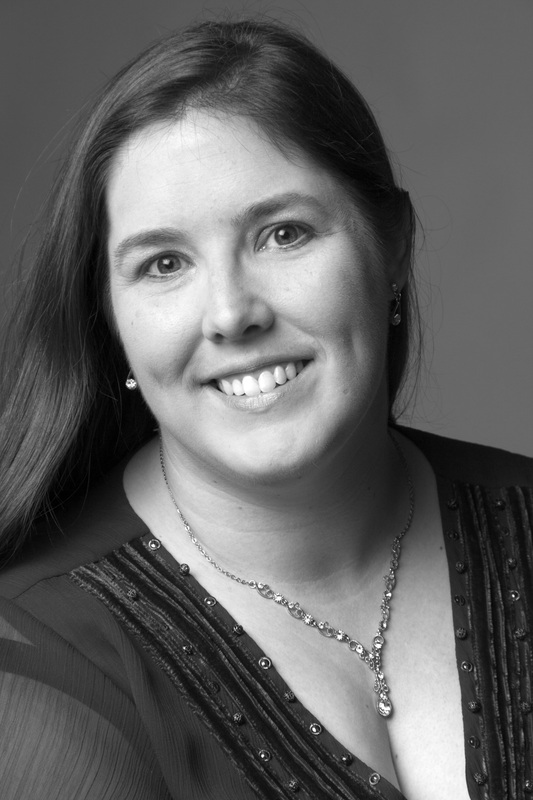 Jessica worked at a multitude of technology jobs during her career, slowly climbing the ladder until at one point she was managing multiple teams. She took each new challenge head on, and learned the skills needed for whatever new role she had obtained. Prior to her passing, Jessica had been working for Maricopa County Community College District since 2005. Jessica always had a love of genealogy, music, technology, photography, and travel. She was an active genealogist who connected multiple families, plotted family trees, and scoured records at the behest of others. She always wanted to experience new sights and sounds: listening to boisterous music, exploring the latest tech, and visiting far off places. She attended hundreds of concerts, learned multiple computer languages, took thousands of photos, and travelled all over the US and Europe. Jessica was always looking to improve herself by learning new hobbies and skills. Very few things scared her and Jessica was always looking to try something new. Cancer took Jessica away from us far too early. Jessica had a tremendous impact on her family and friends. More significantly, she had the biggest effect on her husband. Andrew learned and grew tremendously under her guidance and with her support across these past 21 years. He would not be half the person he is today had she not been by his side. Jessica will be missed terribly by all that knew her. A private celebration of Jessica’s life will be held sometime this summer. For those that wish to honor her memory, Jessica had requested that individuals donate blood as often as they could. Anonymous blood donations were crucial to Jessica’s care during the last months of her life. 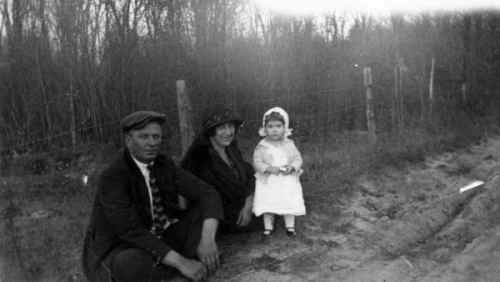 Alta “Ba Ba” Permelia Taylor (1889-1981) was born and raised in Osgood, Ripley County, Indiana. She was the daughter of John Randolph Taylor (1847-1892) and Lavina Isadora “Dora” Knapp (1856-1915). Alta had one sibling, a sister named Lulu Maybel (Taylor) Daugherty. 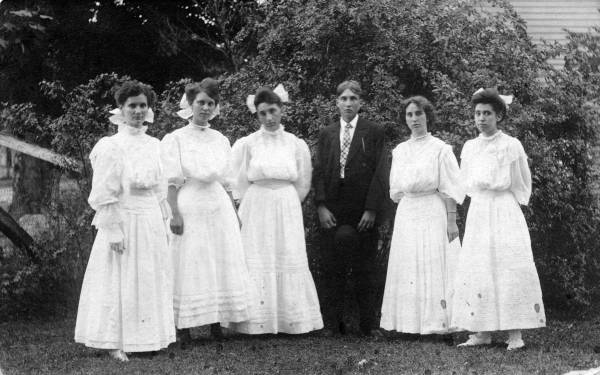 In the photo above, taken at the Knapp Family Reunion in 1898, Alta and her sister Lulu are sitting indian-style in the front on the far left wearing matching light colored dresses. The photo was taken at the home of Alta’s grandfather Adin Williams Knapp, the father of Dora. 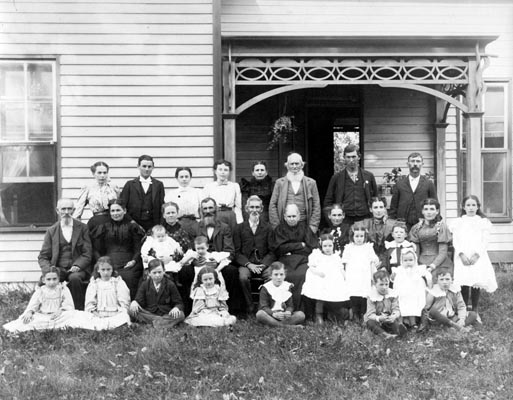 Seated behind Alta on the far left is the girls’ stepfather, James A. Bridges (1831-1909). To his right seated behind Lulu is their mother, Dora, wearing a black dress. Alta graduated from Otter Creek Township Public Schools in Ripley County, Indiana in 1908. She is third from the left in this photo, next to the boy. Archie “Arch” Leland Bostic married Alta on November 22, 1914 in Ripley, Indiana. Together, the two had one daughter named Velma Isadora (Bostic) Green. Velma was my husband’s grandmother, therefore Alta was his great-grandmother. Velma’s children referred to their grandmother Alta as “Ba Ba” throughout her later years. Alta was a lovely, patient woman whose family and friends remember her as a beautiful social butterfly. References to her activities can be found in the Indiana newspapers weekly for decades as a prominent social host and an avid card and Bunco player. 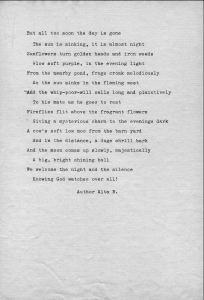 This beautiful poem called “Things to remember” was written and typed by Alta herself. It takes the reader straight to a relaxing summer’s day in rural Indiana, evoking strong images of far simpler times. 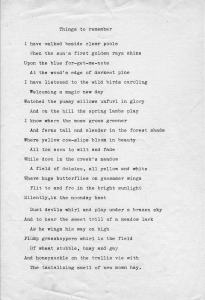 It is undated, so we do not know exactly when she wrote it. 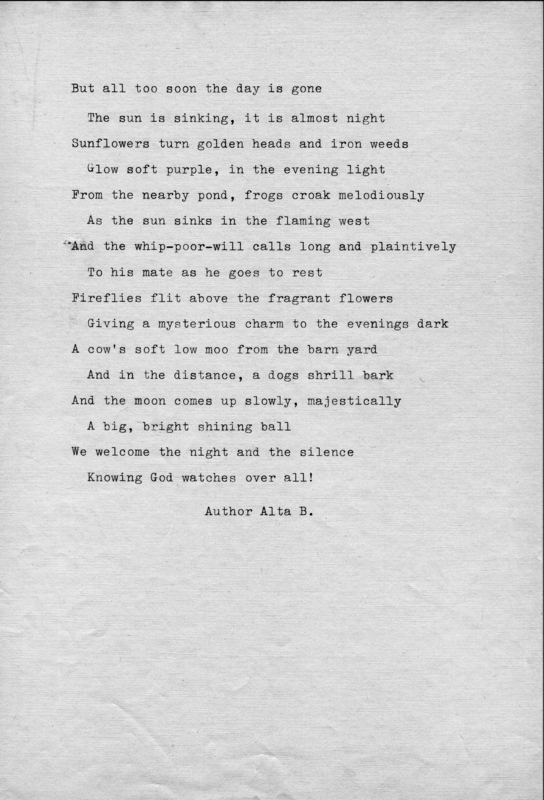 She signed it “Alta B.” which leads me to believe it must have been written before she was married in 1914. The tantalizing smell of new mown hay. Knowing God watches over all! Although I never had an opportunity to meet Alta, I am grateful for her beautiful words and her unending resolve in preserving the past. 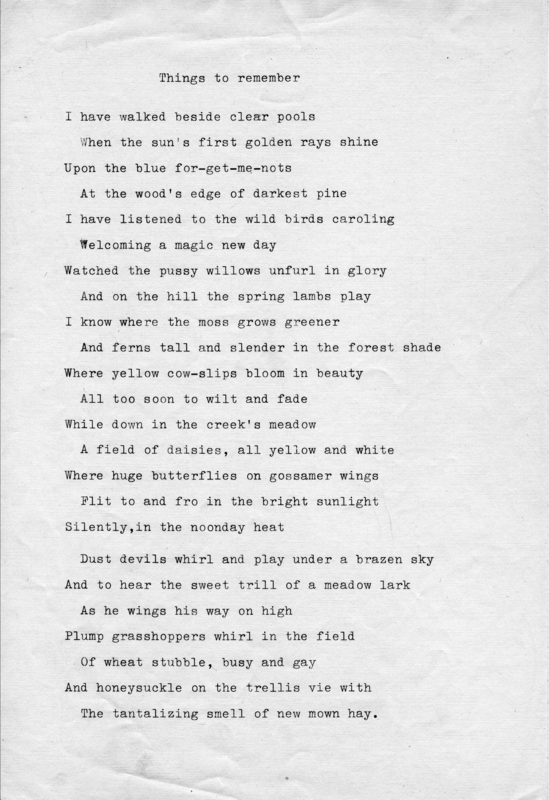 She has left many traces of her memories through her writings that continue to surface in the family’s closets to this day. She even typed an autobiography and hand-colored the covers and title pages. It is currently in the possession of her granddaughter, Barbara Joan (Green) Hilland in Gilbert, Arizona. 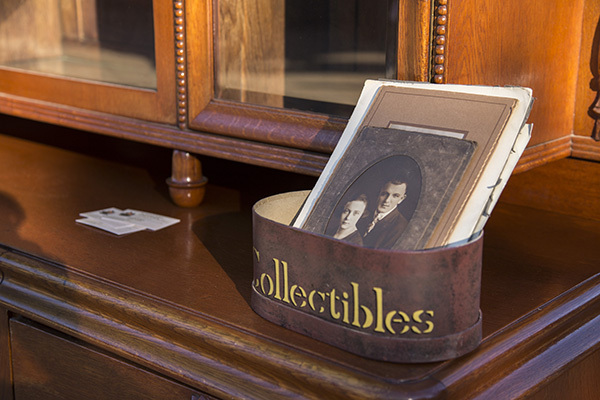 Every once in a while, I wander through an antique shop or flea market. Sometimes, I sift through stacks of old photographs or documents to see if I might get some clues as to their history. Often I will find a name scribbled on the back, or a location or studio name on the front. With enough information, I know I have a reasonable shot at figuring out who is in the photo. That means I have a reasonable shot at returning it to a family member who might be very grateful. Such was the case on November 8, 2014 when I was taking photographs at Schnepf Farms in Queen Creek, Arizona during their Antique Tractor show. I stumbled upon this very scene and took a picture for a class assignment. As I was standing there, the photo on the top spoke to me. What a lovely image! A young couple, dressed very nicely, with striking features. 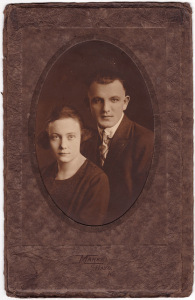 I turned the photo over to find very light pencil marks with “John & Cecelia Gatewood” inscribed. You really had to shift the photo back and forth in the light to see the pencil. I almost didn’t see it at all. On the front of the photo, I could see clearly the photo was taken in Hays, Kansas. I decided to take a chance and buy the photo. The dealer was asking for $5.00. I didn’t even haggle with him. After paying for the photo, I asked him if had other photos from the same family. He didn’t know. I asked him if he knew where the photo may have been acquired. He didn’t know. The only thing he could offer was that he got photos from “all over the place.” That was all I could find out about it. How did this photo of this lovely couple from Kansas end up in Arizona? We still don’t know. We probably never will. After some funny looks from my friends, who surely thought I was nuts, I packed my photo away in my camera bag and continued on with my assignment. Once I returned home, I started my hunt for the Gatewood family. Ancestry.com made my search easy. All I did was put in “John Gatewood” from “Hays, Kansas” with a wife of “Cecelia” and I quickly discovered their 1930 and 1940 US Census records. I knew right away that the family moved to California from Kansas, and that they had their first son in California in 1926. That dated this photo circa 1925, which seemed correct to me based on the style of the frame and their clothing. From the 1940 Census, I knew the couple had two children named Howard and Ronald. With the new information that they had lived in California, I used FindaGrave.com to locate the only John Gatewood buried in California. Find a Grave confirmed that he had a child named Howard, and his wife Cecelia was buried in the same cemetery. Now, it was time to find somebody who cared. I used what I had learned about the couple to search in Ancestry’s member family trees. I easily found two members, Cynthia and Robin, who both had accurate details about this couple in their trees. I wrote to both of them and sat back to await a response. Cynthia wrote me back the same day. She was Howard’s daughter, so John and Cecelia were her grandparents! I sent her a scan of the portrait and asked if she wanted it. She confirmed that this was in fact her grandparents, and she had never seen the photo before. I think she was a little hesitant at first. Who gives something for nothing nowadays? I assured her I didn’t want anything from her in return. After receiving her address, I mailed her the portrait. She was delighted! She said she plans to bring the portrait to Thanksgiving dinner this year and tell her family the whole story. Robin responded a few days later. Cecelia was her great aunt! I was able to explain the whole story and put her in touch with Cynthia. I also sent her a high resolution scan of the portrait for her research. It was the first time she had ever seen a photo of Cecelia before. Success! I am thrilled that I was able to reunite this beautiful portrait with its original family. I hope this story inspires you to do something special to help someone today. You never know what kind of impact your kindness may have on others. My friend Sarah and I just returned today from six full days of research at the Family History Library in Salt Lake City. We spent six months preparing for these six days, so we thought it would be most appropriate if we presented our top six tips for your next visit to the library. There are many sites on the web that offer incredible tips for preparing and visiting the library. These are things we learned upon our arrival and through trial and error. When you’re done reading these tips, check out all of our photos from the Family History Library on Flickr. #1: Dry erase magnets are awesome. Many sites recommend you to bring magnets to quickly refile microfilms. We didn’t see a single patron doing this except for us, and it was such a huge time saver! We picked up these Quartet ReWritables Dry-Erase Magnet Boards prior to our trip and found them to be an amazing way to retrieve and refile microfilm in the stacks. You can pick these up on Amazon.com or in stores at Wal-Mart. Simply determine which film you need, and write the film number on the magnet. Take it into the stacks and retrieve your film. Place the magnet on the outside of the cabinet. When you’re done with the film, easily locate the cabinet by finding your magnet. Erase the film number, and start over again! Cheap, effective and fast. #2: Slashes come after numbers. It took the help of a couple of volunteers at the library for us to figure this one out. 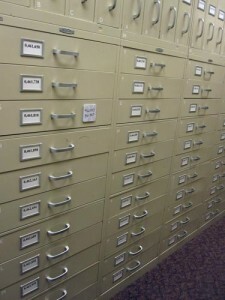 The FHL uses a modified Dewey Decimal system. 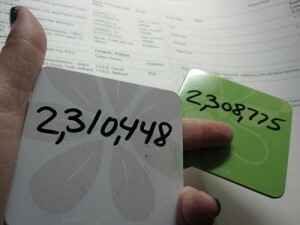 It follows the pattern of numbers coming after letters, for example: “977.4 A5b” comes before “977.4 4a” in the stacks. What we also discovered is that slashes come after numbers. For example: “974.522 H2b” comes before “977.522/A9c” in the stacks. Pay attention to the slashes and make sure you are looking at the section following the last number. We’d also like to note that books can be found in the stacks, in Overflow or in an area called High Density. 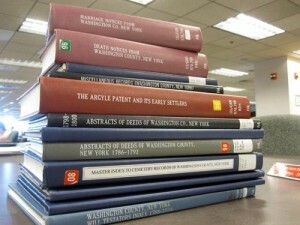 Overflow stacks are located at the end of the main stacks in an area called “Q.” However, High Density books are not accessible to patrons and are not always noted in the catalog. If you can’t find the book you need, ask at the Access Services window. If it’s in High Density, you may need to visit another floor and ask them to retrieve it for you. When this occurs, be prepared to hand over your government ID until you return the book to Access Services. #3: Vault film requests are filed with everything else. If you’ve requested vault films (and we hope you do ahead of time) note that they will be filed in with the rest of the microfilms. You don’t need to ask for them at Access Services. They simply show up. 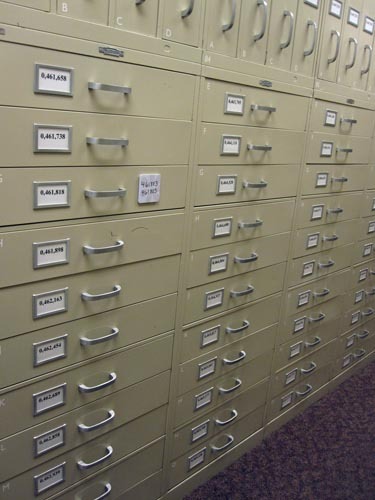 If they aren’t filed in with the rest, they may not have had enough room for your film, so look in the microfilm Overflow section which will be in the last row among the cabinets labeled “Empty.” Look for the Overflow tag attached to a cabinet in that last row. 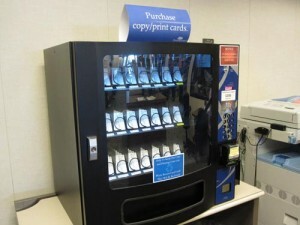 #4: You don’t need a copy card to scan. Scanning is free! 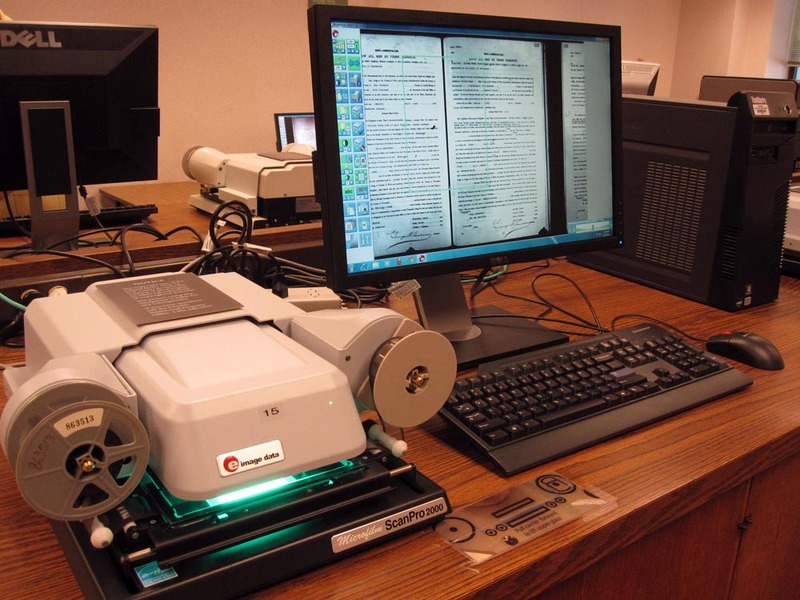 You can scan books or microfilms and it is completely free. Scanning books can be done on any multifunction machine located on any floor. Simply pick up the attached copy card (on a cord) and swipe it to begin. 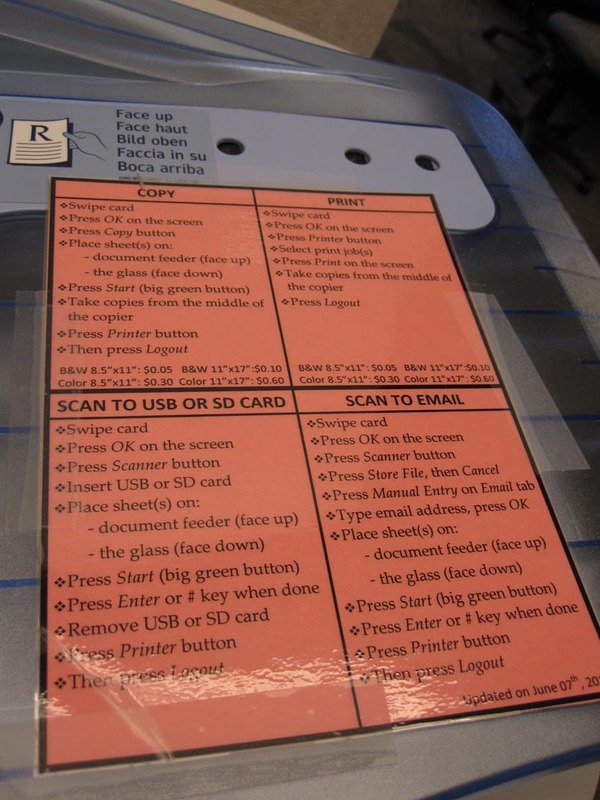 Follow the instructions on the top of the machine to insert your flash drive and scan the document. Note that books scanned in this fashion allow you to scan multiple pages at once, but all scans from your session are embedded into a single PDF file. 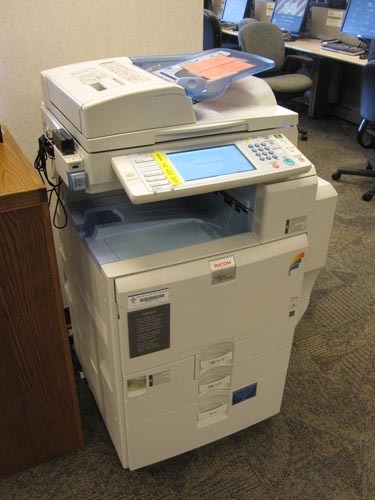 If you are scanning different books, you may wish to end your session and begin a new one after each book so that it creates multiple PDF files. We found the multifunction scanners to be fast, but we had no idea if the results on the flash drive were what we were expecting. There is no feedback to the user with this method. Here’s an example of a document I scanned which the machine descriptively named 20120620202819789.pdf. I had no way of knowing it was sideways or that it was cut off on one side until I looked at it on the computer. You can add your name to the list at the Access Services window on the third floor for a 15-minute time slot on the flatbed scanner. While it affords better feedback to the user and allows you to determine exactly what you are scanning and the file name you are saving it as, the scanner is painfully slow. I found it much more effective to simply take photographs of the book title page and the pages I wanted to keep with my camera. The readability is the same when using macro mode and a steady hand. Most floors have microfilm scanners. 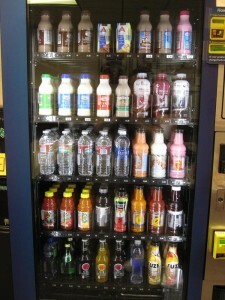 These machines are fast and easy to use, and volunteers are abundant and ready to assist you with the technology. 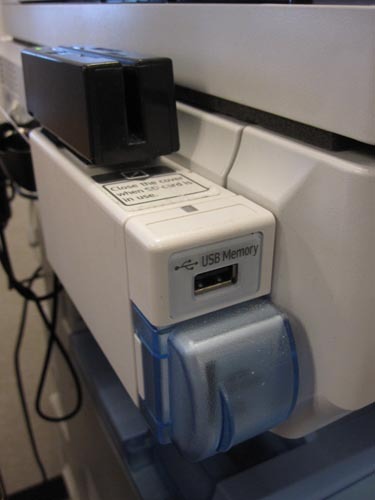 Simply insert your flash drive and click on the button that shows a scanner with a USB stick (duh!) and you can choose what to call your file and where you want to save it. Make sure you are saving the file to your flash drive and not to the hard drive. The application keeps the previous user’s settings so always watch out for that. Also, I recommend saving in both .TIF and .JPG for the best results. The .TIF file will allow you to change exposure and contrast later with no compression loss, while a .JPG copy will be fast for sharing and posting online. It only takes a second to save it twice. 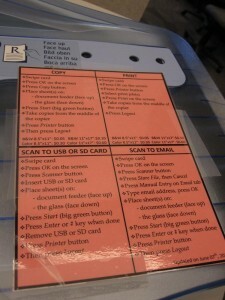 Bonus tip – Use a label maker to adhere your name and cell phone number onto each flash drive you use. If you forget the flash drive in a computer somewhere, some nice soul might contact you to return it. Note that you can’t use the microfilm scanners for long periods of time. The library expects you to find the location on the microfilms using the old fashioned hand crank readers, and then transfer your film to the scanner to scan what you’d like. Ask the volunteers for assistance if you need some help with the setup or the application. Printing is not free. You need you purchase a copy card to print. Regular 8.5×11 black and white prints cost $0.05 each. Bonus tip – when you print to the print server from any computer, it asks you to enter your initials and an identifier so you know which document you are printing. One of the volunteers mentioned to me that it is advantageous to add extra spaces in front of your identifier because spaces show up at the top of the list. For example, ” My File” will show up before “My File” in the list of everyone’s print jobs. It’s a sneaky way to make sure your prints show up at the top of the list when you print your files. 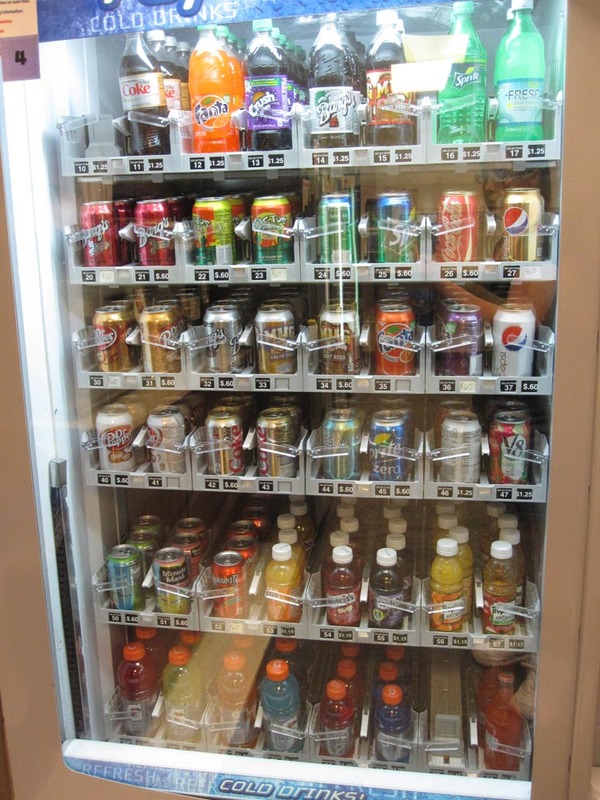 #5: There is no caffeine in the building. Caffeine is a stimulator and an addictive substance, something that the Mormon culture does not support. You will not find any caffeine in the break room. 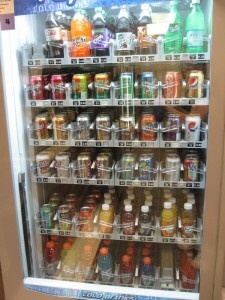 No coffee; no Coke or Pepsi. 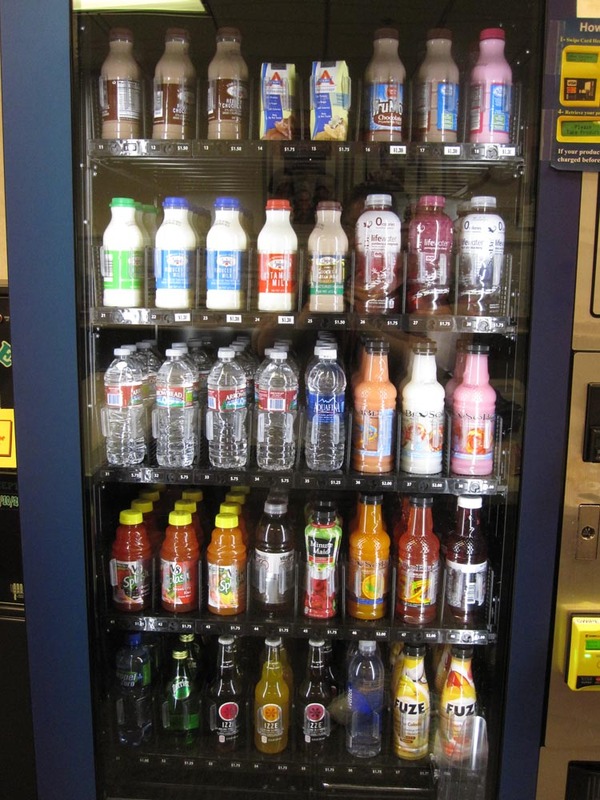 They do have non-caffeinated beverages such as milk, chocolate milk, juice, Caffeine Free Diet Coke, Sprite, Cactus Cooler and the like. If you want a caffeine fix we recommend heading either to JB’s Restaurant for a break, or go to the gift shop or onto one of the floors in the Plaza Hotel next door where they have Coke products in the vending machines. #6: Ask, and then ask again. And then ask again. And again, if you need to. We cannot stress this last tip enough. We read this on a few sites during our preparation for the trip, but I’m going to tell you my story so it sinks in for you! I’ve got a brick wall on my mother’s side. Her father’s father came to the USA around 1891 from “Germany.” That’s all I know. I approached a volunteer and I asked her if she knew of any resources to search immigration or ship records from Germany which were not already online. She pointed me to FamilySearch.org and said to use the computers to look up what I needed. Not helpful. The second time I went to a different staff member, and asked him if he knew of any Naturalization records available that might help me with my brick wall. He said usually the library doesn’t keep Naturalization records because the NARA sites want to charge for them. (Not true – they have all of them on microfilm onsite for the county I needed.) He showed me as he navigated on his computer to the place in the catalog for Naturalization records for Otsego County, Michigan. Then he clicked on the film number and was presented with the screen to “order” the film to your local FHL center. He proceeded to explain to me that this was how I could “order” the Naturalization record from the National Archives. OMG. We’re going backwards here. As a final last ditch attempt, on the International floor I approached a woman near the Maps area. I asked her if she could point me to any maps of Poland while it was under German occupation. As it turned out, she was a professional genealogist. She proceeded to dig deeper and deeper into my story and worked with me for more than an HOUR one-on-one, giving me one lead after the next. 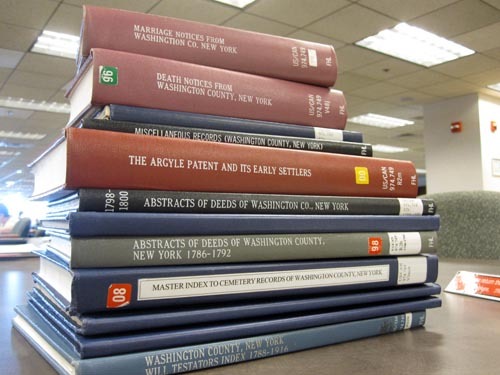 She poured over the documents that I had such as the Naturalization papers, obituaries and census records, and allowed me to take notes on more than a dozen ways I might be able to get the information I need. The experience was incredible! She was incredible. I am so glad I asked her where to find a map of Poland. 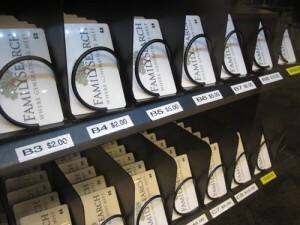 The people at the Family History Library are a mix of staff, volunteers and professional genealogists. There is no way of knowing who is whom by just looking at them. You might approach one person and he is a volunteer missionary, and the woman sitting next to him might be a professional genealogist. It pays to keep asking until you get the help you need. Ask questions in different ways. Ask different people. Ask at different times or on different days. You never know where it might lead you. We hope these tips help you during your experience at the Family History Center. Remember to take lots of breaks, and get out there to see the sights in Salt Lake City. The area is beautiful and has plenty of fun to offer. Salt Lake City, here we come! I am off to Salt Lake City this morning for a one-in-a-lifetime trip to the Family History Library. One of my dearest friends is flying in and meeting me there for the next 7 days. We’ve been planning this trip for months! Between us we have 22 pages of microfilms, microfiche and books to review while we’re at the library. This will be a girl’s week to remember. At the advice of many before us, we’ve got a few sightseeing sidebars planned along the way. So many people who have gone to Salt Lake City for research said they wished they had taken some time off to go see the area. We’re planning to spend about 4-6 hours per day at the library and the other half at various destinations around Utah, Wyoming and Idaho. It should break up the long hours of research and save our backs along the way. We might also get some good pictures to share! I hope to find a few nuggets to post here on the site upon my return. Wish us luck! Our hearts go out to the Sanelli family. 63, of Cave Creek, Arizona, passed away suddenly May 22, 2012, at his home with his wife nearby. He was born November 6, 1948, in Elmhurst, Illinois, the son of Danny A. Sanelli and Wanda L. Helm. He was the oldest of 4 siblings. The family later moved to Phoenix, Arizona in 1958. Larry graduated from Camelback High School in 1967 and proceeded to earn various degrees in computer science/technologies and programming. He married Carla Glober on Sept. 4, 1986 and the couple welcomed the birth of their son, Matthew Daniel Sanelli on August 29, 1991. The couple later divorced and Larry married Judy Landers on November 22, 2010 in Oak Creek Canyon, Arizona. Larry started with the State of Arizona in the Health Services department as a computer programmer. He then was promoted to the Department of Administration for many years, then took a promotion to American Express, then to PCS, then to Charles Schwab, then back to Department of Administration. He was very well-liked by his co-workers and made them laugh. Larry was very respected in his field and really had a razor sharp wit that everyone enjoyed. He was also an emotional, sensitive guy who really cared about his career and kept reaching for the pinnacle while striving for perfection. He was very bright and always fully believed that knowledge was power and success was forthcoming. Larry had a tender and giving heart and was always mindful of keeping family ties strong. One of his highest priorities was to spend quality time with family and friends and typically be the “life of the party” at any social event. He possessed a zest for living, was fun to be around, and was helpful to anyone in need. He enjoyed fast cars, speed boats, road trips, target practice in the desert, and loved animals, especially his beloved dog, “Scruffy” a rescue dog from the Animal Shelter. Any spare time was spent working on a variety of home improvement projects. Larry was talented mechanically and could fix anything and everything. Larry achieved many successes in life but also in the end, embraced a quieter, spiritual relationship with his Creator.He is survived by his wife, Judy Landers-Sanelli, son, Matthew Sanelli of Phoenix, AZ; father and step-mother, Danny & Eleanor Sanelli of Scottsdale, AZ; mother, Wanda Helm of Scottsdale, AZ; brother and sister-in-law, Kenneth & Rachel Sanelli of Scottsdale, AZ; brother and sister-in-law, Mark & Cornelia Sanelli of Scottsdale, AZ; sister, Laurie Scott of Bozeman, MT; nephews, Steven Sanelli, Brent Scott, and Hunter Sanelli; niece, Cheryl Sanelli and numerous aunts, uncles and cousins. Larry is preceded in death by his step-father, William Helm. A Memorial Service will be held Saturday, June 9th at 10:00am at the Franciscan Renewal Center in Paradise Valley, AZ. This is the obituary for Meta (Kunst) Buchinger. It was published in The Saginaw News on March 02, 1948 on page 18. Meta Buchinger is the 3rd great-grandmother of my half-brother, Noah, on his maternal side. Died Monday a.m. at St. Mary’s Hospital after a short illness. Meta Kunst was born Fe. 4, 1877 in Saginaw. 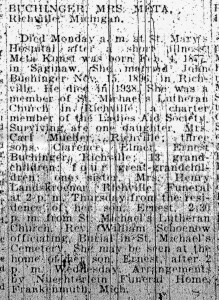 She married John Buchinger Nov. 15, 1896 in Richville. He died in 1938. She was a member of St. Michael’s Lutheran Church in Richville; a charter member of the Ladies Aid Society. 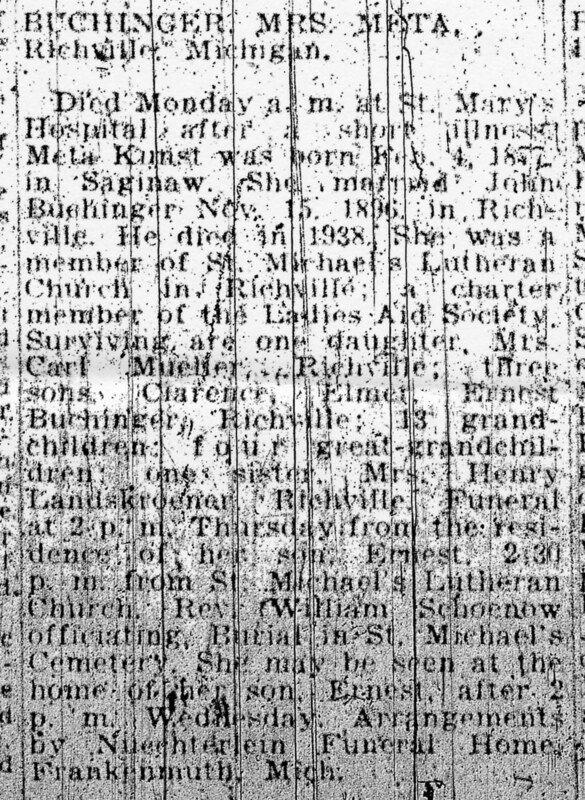 Surviving are one daughter, Mrs. Carl Mueller, Richville; three sons, Clarence, Elmer, Ernest Buchinger, Richville; 13 grandchildren; four great-grandchildren; one sister, Mrs. Henry Landskroener, Richville. Funeral at 2 p.m. Thursday from the residence of her son, Ernest, 2:30 p.m. from St. Michael’s Lutheran Church. Rev. William Schoenow officiating. Burian in St. Michael’s Cemetery. She may be seen at the home of her son, Ernest, after 2 p.m. Wednesday. Arrangements by Nuechteklein Funeral Home, Frankenmuch, Mich. This is the death notice for Elizabeth Humes, published in The Saginaw Weekly Enterprise on October 13, 1964. Elizabeth is listed in the second column, third from the bottom. Her name is highlighted in a red box. Elizabeth Humes is the 5th great-grandmother of my half-brother, Noah, on his maternal side. I don’ t know her maiden name, or much about where she came from. The family believes she may have been born in Scotland. She was married to William Humes, born about 1801 in Scotland. My half brother is descended from their son, Alexander D Humes (1832 – 1896). Since this death notice simply states Elizabeth Humes died within the year, we are unsure of her exact death date. I do not believe there was an actual obituary published for her in Saginaw. Sunday’s Obituary – John Michael Buchinger, Sr.
Obituary for John Michael Buchinger, Sr. This is the obituary for John Michael Buchinger, Sr. It was published in The Saginaw News on March 25, 1914 on page 7. 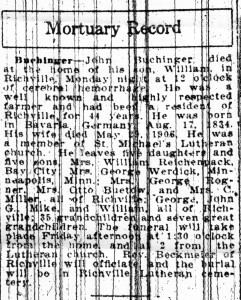 John Michael Buchinger, Sr is the 4th great-grandfather of my half-brother, Noah, on his maternal side. Buchinger – John Buchinger died at the home of his won, William, in Richville Monday night at 12 o’clock of cerebral hemorrhage. He was a well known and highly respected farmer and had been a resident of Richville for 44 years. He was born in Bavaria, Germany Aug. 17, 1834. His wife died May 29, 1906. He was a member of St. Michael’s Lutheran church. 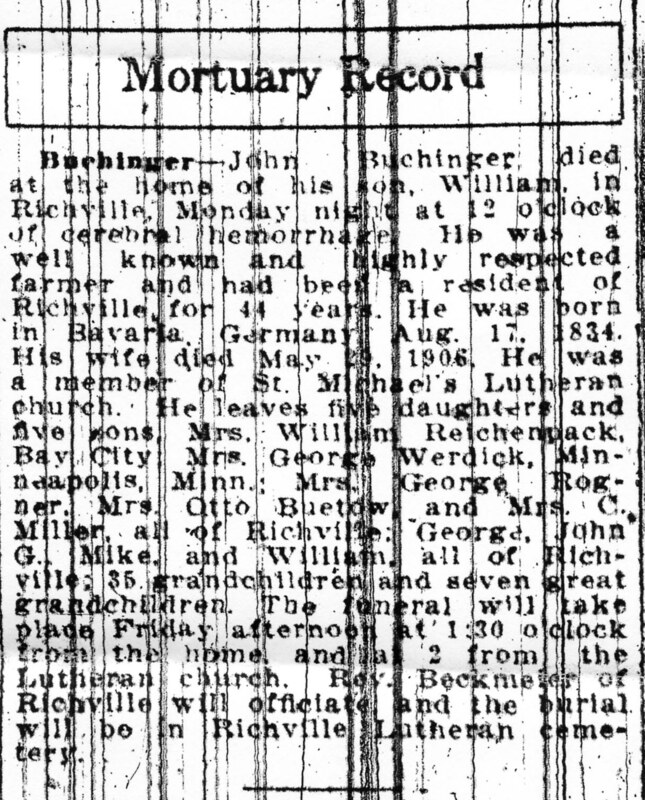 He leaves five daughters and five sons, Mrs. William Reichenpack, Bay City; Mrs. George Werdick, Minneapolis, Minn.; Mrs. George Rogner, Mrs. Otto Buetow, and Mrs. C. Miller, all of Richville; George, John G., Mike and William all of Richville; 35 grandchildren and seven great-grandchildren. The funeral will take place Friday afternoon at 1:30 o’clock from the home and at 2 from the Lutheran church. Rev. Beckmeier of Richville will officiate and the burial will be in Richville Lutheran cemetery. As a follow-up to my recent blog post about Fame as part of my 52 Weeks of Personal Genealogy & History series, I present the latest addition to the collection of published family members. My mom, Diane Kane, was featured in an article in the Ogemaw County Voice in Ogemaw County, Michigan. 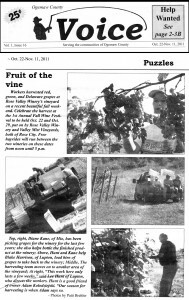 This is from the October 22-November 11, 2011 issue which is Volume 1, Issue 16, Page 11. She is shown picking grapes at the winery she is employed with in Rose City. Workers harvested red, green, and Delaware grapes at Rose Valley Winery’s vineyard on a recent beautiful fall weekend. Celebrate the harvest at the 1st Annual Fall Wine Festival to be held Oct. 22 and Oct. 29, put on by Rose Valley Winery and Valley Mist vineyards, both of Rose City. Free hayrides will run between the two wineries on these dates from noon until 5 p.m.
How fun is that? What a treasure!